The first set of features has to do with collection of solid waste and the separation of fluid waste, so that the fluid waste can be used for garden and plant growth. A special ceramic toilet pan was designed so that in use, the solid matter and fluids can be separated. The solids are collected in a sealed compartment, and the fluid waste is diverted so that it can be used immediately to enhance garden watering. Ash (or other drying material, such as sand or sawdust) is added to the solid waste to eliminate smell. This ash also improves the composition of the compost that is created by this process. 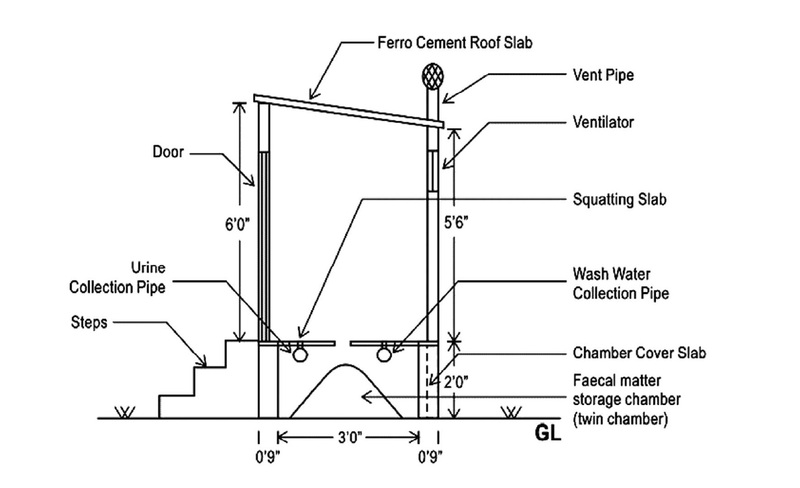 The Toilet is built with two solid waste collection compartments. One is used until it is full. Then it is sealed and the other compartment is used. The sealed compartment will naturally compost over the next six months. During this process it is heated past 160° C, so that all bacteria are destroyed and the resulting compost is safe for use. The fluids are best used to water food plants for the family. In our project, often Banana plants, chilies or tomatoes are watered by the fluid waste from the Ecosan Toilet. Mango trees and coconut palms are also watered by the fluids collected from the Ecosan Toilet.